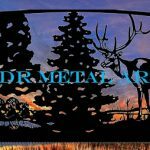 Wrought iron driveway gates Archives - Custom Driveway Gates - Iron Steel & Aluminum - JDR Metal Art - FREE Standard Shipping! 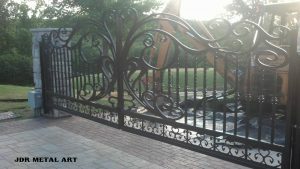 Here’s a fantastic wrought iron gate project we did for a repeat customer from Pennsylvania. 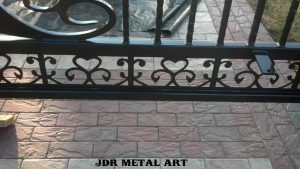 They like hearts and wanted them to be an integral part of the gate design. The large scroll in the center is plasma cut from 1″ plate steel. Each gate panel weighs approximately 400lbs. There are also side panels which we will be mounting sometime in the next month or so! We cut the bottom sections of scroll work by hand. We took the cresting from the top of our client’s home and applied the same design to the bottom sections. There were 36′ of scroll work total, it was very tedious work keeping the look consistent across so much space! These steel gate posts are still hot in the powder coat oven. They are 4×4 square tubing with a 3/8″ wall thickness. Each one weighs around 150lbs!! 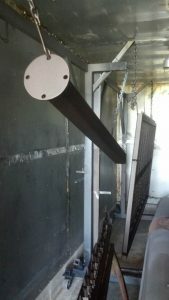 We used a three coat process when powder coating this set of gates. 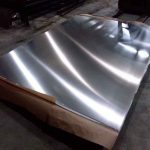 The first coat is a zinc rich primer coat which prevents any rust from forming beneath the coating. The second coat is oil rubbed bronze, a metallic top coat. The third and final coat is a 100% gloss clear coat. 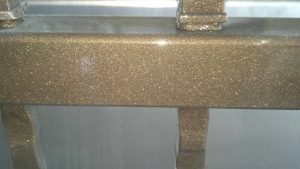 The clear coat is what really makes the top coat look so fantastic in the light. The gates and fence panels can be rather deceptive when it comes to what color they are…it’s all a matter of lighting and there is no doubt what color it is once the sun hits it! 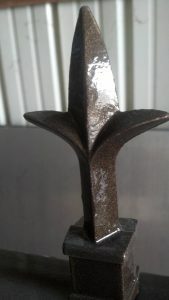 These finials are about 5″ tall and made from cast iron. 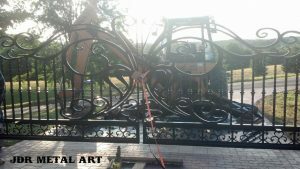 Cast iron is a very brittle metal and I often see gates and fences missing finials because they have fallen off where the weld failed. Instead of welding them on we used JB Weld epoxy to firmly join them to the side fence panels. If any of the finials are bumped and broken they can be easily replaced. 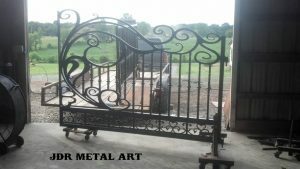 Need a driveway gate? Contact us today to get started! We build many types of driveway gates. Anything you can imagine, we can build it for you! We look forward to hearing from you!